"Those jeans look so comfortable"
Our innovative 5 pocket pants combines the style of denim with the comfort of cotton and is sure to become your new favorite pair of pants. 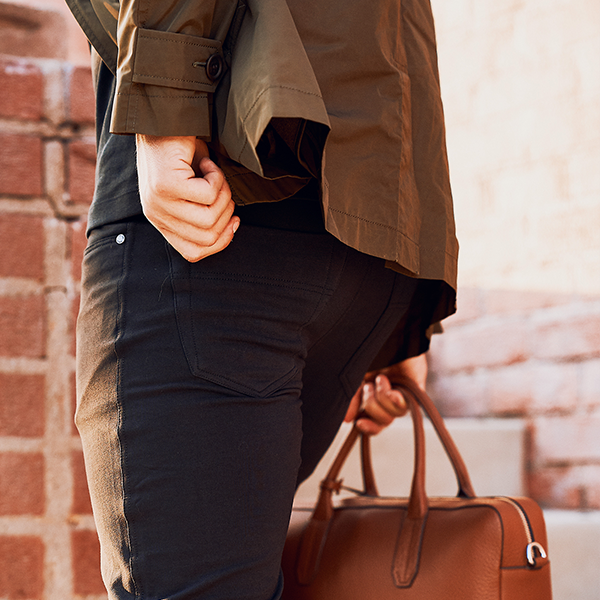 not against you, while the modern fit and tapered leg keeps you looking put together at all times. Very versatile pant. Casual day on a bike to the beach or out to dinner. Look the part in any scenario with no sartorial comprises. Each pair fits different and the ST team with make sure you get the fit you like. Give them a try unless you like being uncomfortable, then keep wearing your current pants. I just bought my first pair of Sweat Tailor pants, and I find myself wanting to wear them much more than even my most comfortable jeans. I'm definitely buying more. These pants are incredible! Soft, stretchy, sooooo comfortable, and yet they look sharp enough to wear to the office (which is EXACTLY what I'll be doing...don't tell anyone). Bought only one pair, but I will immediately be ordering more. These sweats are everything Sweat Tailor says. There fit like tailored jeans but are comfortable like sweats. I never want to take them off. I used my regular jean measurements and they fit perfect. The pockets are not that deep, but that’s not a problem. You can lounge at home and then run into the store in them and not feel like a slob.